This free hand embroidery pattern featuring a prancing deer can be worked in nearly any technique! In these samples, I've worked the same deer pattern in surface embroidery, crewel embroidery, and pulled thread stitches for a classic whitework look. Varying shades of brown and tan six-strand embroidery floss were used in the colored samples (accented with a green floss bow worked on the neck of the deer) while the third design was worked entirely in white floss. This simple design worked in different techniques would make a unique set of Christmas ornaments or gift tags! The pattern for the deer can be found in step 5, so you can work your own version. For best results, use an embroidery hoop when working this project. The first deer is worked in chain stitch - a stitch commonly used in crewel embroidery - worked both to outline the deer and as the filling, by working the lines of chain stitch close together. French knots were used as an accent along the deer's back. Two strands of the six-strand cotton embroidery floss were used throughout. Stem stitch, a basic surface embroidery stitch was used to work this version of the prancing deer pattern. The same stitch was used as a filling along the lateral band on the side of the deer, and French knots were worked along the back area, but seed stitches would like nice here as well. Two strands of the six-strand embroidery floss were used throughout. 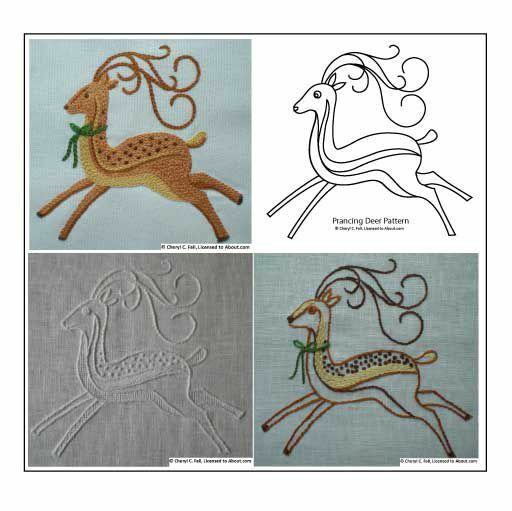 This version of the prancing deer pattern was worked similarly to the one shown in step 2 using stem stitch and French knots. The difference here is that it was worked entirely in white - often referred to as whitework - with simple pulled thread stitches used to accent the two front legs and the underbelly of the deer. Satin stitch was used to work the lateral band on the side of the deer. Two strands of the six-strand embroidery floss were used for the surface embroidery stitches, with a single strand used for the pulled thread areas. Use this pattern to create your own unique version of the prancing deer using your favorite embroidery stitches. The pattern is provided as a .jpg file, so you can easily enlarge or reduce the pattern using basic photo editing software on your computer. To transfer the reindeer design to fabric, fold the square of evenweave fabric into quarters and mark the center point of the base fabric. Center the pattern under the fabric and *trace the embroidery design onto the fabric using the water-soluble fabric marking pen. *TIP: If you have difficulty seeing the pattern through the fabric, use a light box, or trace the design by holding the fabric and pattern up to a window. Please Note: Photographs, patterns and illustrations contained in this article are by Cheryl Fall, are copyrighted © by Cheryl Fall, and licensed to About.com, Inc.
Do not redistribute these photographs or illustrations in any form. This pattern is free for your own personal use only and is not to be used for items for resale. If others would like to have the pattern, please give them the URL of this page, so that they may come to these pages and print the pattern for themselves. Thank you for respecting my copyright. For additional information, see Copyright Myths Explained, or the U.S. Government Copyright Office at http://www.loc.gov/copyright.